CEOs in the CFD and FX industry are business savvy, but they could be missing out on the benefits of social media. And while a number of CEOs in this highly competitive and regulated industry are starting to embrace social media within the CFD & Forex space, many of them may be missing out. The converted and early users are singing praises and are keenly promoting it through their daily use. On the other hand, the late adopters may still be dipping their toes and are just not ready to wade into the social media pool. If you look at it, different industries and businesses have embraced social media with varying degrees of enthusiasm. For example, retailers and telecommunications companies are actively using social media channels to promote their products and services. They also proactively use social media channels to engage directly with their customers in a support capacity. On the other hand, the legal industry and other professional services sectors have been slow in adopting or using social media. There is still a high level of caution and reservation in embracing this communications tool. In the CFD and FX industry, we are seeing this divergence between those early adopters and active users of social media and those who are not very active and may still be testing or questioning the benefits it delivers. Profile Booster embarked on an initial research to determine the level of social media usage among CFD and FX providers in Australia. Our aim is to find out which companies are using social media channels to boost their corporate profiles. We also would like to see if CEOs in this highly competitive sector are using social media to the max. After all, social media is proving to be the most effective and efficient way to reach a wide range of audience. The initial findings paint a mixed picture of social media usage. But it provides us with some interesting insights that we can build on in the years to come. At the corporate level, most CFD and FX providers have a presence and many are actively using social media. The two most commonly used channels are LinkedIn and Twitter. This is expected and is in line with the current level of usage in the corporate arena. Note: These numbers are based on publicly available data taken from the actual Twitter account of each respective company as at the 28th of February 2016. At the CEO level, the picture is a little bit different. Though most CEOs have a presence on LinkedIn, many of the accounts are quite static or with a low level of participation. For example, some CEOs have very limited details on their profile. Some profiles have not even been updated for several months or even years. Many CEOs have barely shared or posted any updates on their profiles or commented on any post from other people. When it comes to Twitter, it seems like no CEO in the CFD and FX industry is keen to use this channel at all. It was a challenge to find a CEO with a Twitter handle. This is a bit confounding because a number of CEOs who responded to our survey said they definitely see the benefit of using social media. Though we saw this translate at the corporate level, this is not the case on an individual or CEO level. Gareth Llewellyn, owner of Artechulate Social Communications, which provides managed services for senior executives’ social media profiles, shares some insights into the low level of social media usage among CEOs and other top level executives. Llewellyn, who is considered one of the pioneers and proponents of social media in Australia given his early works in the IT industry, has been giving advice to CEOs and corporate clients on how to implement social media strategies. According to Llewellyn, “CEOs’ usage of social media is about vision. The “I don’t have time for that” conclusion is very common. In the US, a 2015 Social CEO Report published by CEO.com acknowledged there is a shortage of big-name chief executives who are active on blogs, Twitter and Facebook. In the same report, it listed the top 25 CEOs in the US who are actively using Twitter including Peter Cashmore (Mashable), Martha Stewart (Martha Steward Living), Bill Gates (Microsoft), Tony Hsieh (Zappos.com) and Tim O’Reilly (O’Reilly Media). In the Australian CFD and FX industry, one of the active users and proponents of social media is Gavin White, chief executive officer at Invast Australia. White confirms that social media is an important part of their overall marketing strategy. He said: “Social media has presented us with more opportunities to convert and nurture leads into clients. Andrew Taylor, chief executive officer at Royal Financial Trading, is also a believer in using social media to reach out and to connect with people. While many CEOs and top executives still need to be convinced of the benefits of using social media to enhance their corporate and personal profiles, there are numbers to show the positive impact of social media presence on client/consumer behaviour. 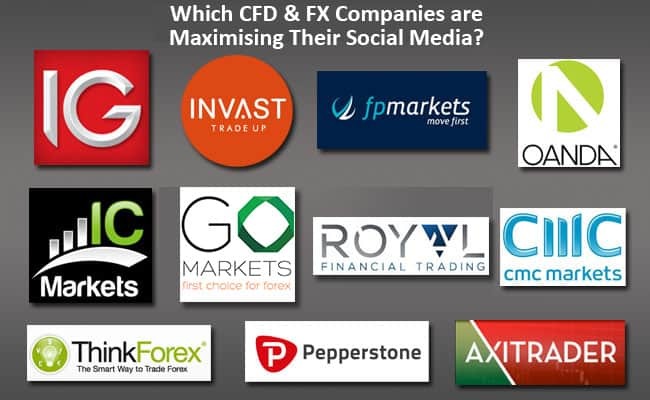 A number of CEOs in the CFD and FX industry have also confirmed the benefits of social media to their overall marketing success. For some, the ability to reach a wide range of audience and to shorten the sales process is a big benefit already. For others, it is direct and positive engagement with clients who are also active on social media, that’s a major benefit. In a recent interview, Nola Weinstein, head of executive engagement at Twitter cited some figures showing more than 80 per cent of customers are even more likely to buy from and work for a company whose executive team are active on social media. Whether CEOs will soon be convinced by the mounting evidence of the positive benefits of social media or not remains to be seen. In the meantime, a more comprehensive research into the social media usage of CEOs in the Australian CFD and FX industry is still ongoing. We will be sharing the results of the research within the next three months.